It can be said that a nation’s architecture and national identity can be defined by the way it builds its own houses. Whilst this may be true to some degree, it is very difficult to judge in the case of Fin-die Siècle Britain. Strict class division meant that the majority of houses were working or lower-middle class and they were primarily built for function and cost-efficiency rather than for any particular architectural achievements. Where most of the advancements in home-architecture appear are primarily in and on the houses of the wealthy, however, a relatively new type of house-building was to define Edwardian Britain even more than the large mansions of the rich: the moderate-sized home aimed at the ever growing middle class. Home-building during the Fin-de-Siècle became something of a complex sport for many architects with each trying to out-innovate the other whilst at the same time imitating the successes of the other. That being said, the competition in the house sector was nowhere near as fierce as it was in the large-building sector.10 The unchallenged king of architecture, however, during the end of the nineteenth and beginning of the twentieth centuries is a man by the name of Norman Shaw. His work in both domestic as well as large-building architecture is almost universally considered to be the most important of any architect in the the Fin-de-Siècle. Throughout his career, Shaw managed to create a very unique style which influenced architects for many generations after him. He ‘gained recognition for the red brick architecture using Classical motifs, known as the “Queen Anne” style’.11 Like his contemporaries, Shaw wanted to create a new style of specifically English architecture which would not be recognisable as being a style which already existed. Although Shaw failed to some degree in this endeavour — also like his contemporaries, it did lead to many of his unique designs which he became famous for. Leyswood in Sussex and Cragside in Northumberland are two examples of houses he designed which best showcase his style of mixing ‘Old English’ motives with new and creative ideas. Another common theme in his work was ‘seventeenth-century motives in brick or in brick with stone quoins and dressings’.12 Although he is arguably the most famous architect of the time, he was certainly not the only architect to become well-known for his house designs. 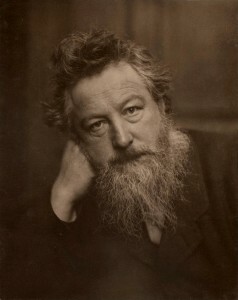 Two of the chief architects of the moderate-sized Edwardian house are William Morris and Philip Webb.13 Together with Shaw, they were leaders of one of many movements occurring simultaneously: the ‘Arts and Crafts’ movement.14 This movement saw a new creativity and ‘artsy’ style of design with many flowing curves. It was in many aspects the antithesis of the Classical style which focussed on symmetry and blockiness. Both Morris and Webb were trained in the styles of Gothic Revival architecture, but it was largely through their innovations in style that distinguish the Fin-de-Siècle house from its High Victorian predecessor. Although it is quite difficult to distinguish who exactly was the first architect to use which new style, it is clear that both Morris and Webb were leaders in their field. Morris, born in 1834, founded his design firm Morris & Co in 1861 which he would use to create innovative designs in wallpapers, furnishings, stained-glass windows and many types of other domestic products.15 These designs were based on the nineteenth-century notion of ‘the values of pre-industrial England, a mythical land of craftsmen, contented peasants, and romance‘.16 Morris himself did not directly confront industrialisation, although he opposed it. Instead, he used his designs to depict the values of a rural, self-sufficient society.17 His unique designs influenced many future designers and architects, including Philip Webb. Webb became arguably one of the most influential architects of houses in the Late Victorian and Edwardian eras. Morris helped him launch his career in 1859 when he commissioned a house called ‘Red House’ in Bexleyheath to be designed and hired Webb to do it.18 His most famous works are Red House and another house called Standen in West Sussex. Both are outstanding examples of his work in that they were based on his design philosophy that houses should be created to match the style of their particular neighbourhood. 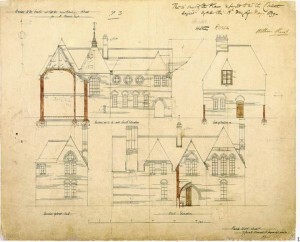 This principle meant that he never really developed a trademark style of his own, but his houses were nonetheless often visited by and subsequently influenced many young architects.19 Although he did design larger houses for the wealthy such as Red House and Standen, Webb’s primary focus ‘was to bring upper-class house-design back to a vernacular simplicity, from which what was called “Queen Anne” emerged’.20 Many of the elements used in Webb’s as well as Morris’s house designs became very popular and came to define the houses of the period. 10 Summerson, The Turn of the Century: Architecture in Britain around 1900, p. 5. 11 Service, Edwardian Architecture: A Handbook to Building Design in Britain 1890-1914, p. 14. 12 Ensor, England: 1870-1914, p. 324. 13 Service, Edwardian Architecture: A Handbook to Building Design in Britain 1890-1914, p. 14. 15 John Cannon, Oxford Dictionary of British History (Oxford, 2009), p. 447. 16 Kenneth O. Morgan, The Oxford History of Britain (Oxford, 2010), p. 568. 18 Service, Edwardian Architecture: A Handbook to Building Design in Britain 1890-1914, p. 14. 20 Ensor, England: 1870-1914, p. 324. This entry was written by Alex Seifert, posted on February 9, 2016 at 3:26 pm, filed under 19th Century, 20th Century, Architecture and Buildings, British History, Edwardian, Featured, Houses, Houses in Fin-de-Siècle Britain, Multi-Part Series, Victorian and tagged Architecture, Britain, Fin de Siecle, Houses. Bookmark the permalink. Follow any comments here with the RSS feed for this post. Post a comment or leave a trackback: Trackback URL.